8918 Carapar is a BIONICLE set released in 2007. He is one of the Barraki. He has a claw on one hand (in the BIONICLE universe he had two but, the other one was currently detached) and a Squid Launcher in the other. There are two holders for Sea Squid on his left shoulder. He is brown and yellow with red eyes. In the BIONICLE universe, he commanded an army of Keras and Pit War Tortoises. He was often hypnotized by Takadox. He also appeared in the story Federation of Fear where he joined Brutaka and several others to find Miserix. Carapar was once one of the six warlords that controlled the Matoran Universe, but was brought down and thrown into The Pit, an underwater prison guarded by Hydraxon, until the pit collapsed, and they all broke free. They were transformed by bacteria called mutagen, into a group of sea monsters. He died trying to kill Tren Krom, when a beam of energy shot from the entity's eyes and shattered him. 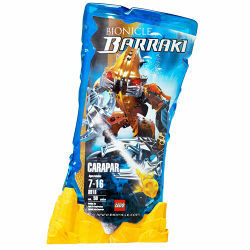 Carapar is the only Barraki who does not have a minifigure variation. This is a description taken from LEGO.com. Please do not modify it. (see an archive of the product's page) Beware the claws of Carapar! The strongest of the Barraki, Carapar claws can crush or shred anything in his way. His armored shell makes him invulnerable to just about everything but electrical attack. Close in, and you are trapped in his claws -- stay away, and he will get you with his sea squid launcher. Either way, Carapar rules the sea! Beware the claws of Carapar!